Glacial Chasm + Throne of the High City to remain the eternal monarch! Generally speaking the deck is not fast, but ramps out fairly consistently and just sits behind the Glacial Chasm which makes this land the backbone of most strategies. Protect it at all costs and be wary of any time it would enter the graveyard so that you don't fall foul of any graveyard hate sitting on the battlefield or in your opponents' hand. The best time to go for it with cycling the Glacial Chasm through the graveyard to reset age counters is when you have any of the instant speed ways to retrieve the chasm, such as Petrified Field , Grapple with the Past or Turntimber Sower to prevent it being exiled. 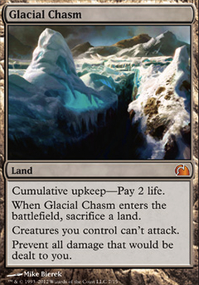 Over the course of most games, the damage prevention will often far exceed whatever upkeep costs you have to pay for Glacial Chasm . Most decks have very few ways to interact with land or only a few kill spells like Assassin's Trophy or maybe a Vindicate but it takes a conceited effort to take out a Glacial Chasm , so either try to fly under the radar for long enough that you simply get ignored while the other player infight or try to ally with another player by providing removal or ramp with political cards like Pir's Whim or board hugging with Rites of Flourishing . Other ways are to use your own land to deal with permanents providing issues such as Alchemist's Refuge or Yavimaya Hollow in the land category or maybe proactively removing their own Wasteland s or Strip Mines with yours to clear the way for a Glacial Chasm . Searching out a Bojuka Bog at instant speed with a Crop Rotation is key to dealing with graveyard strategies and hopefully Homeward Path should come in handy in the event that your opponent steals creatures from your board or graveyard. Turn those lands into spells by discarding to the uptick. 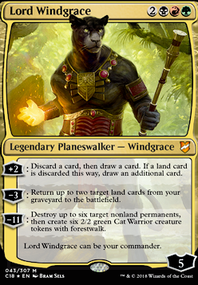 The only effective way to protect Lord Windgrace I've found is to use Constant Mists to fog attacks as often your opponents will have larger and more effective board presence than you until the late game. Maze of Ith comes in handy with dealing with singular attackers, but don't expect this to be an effective defense for long as it cannot deal with multiple attackers or anything equipped with Lightning Greaves or Swiftfoot Boots . Adding in Exploration as it allows for more potential ramp early game in addition to synergizing well with graveyard land playing cards like Ramunap Excavator or Crucible of Worlds whereas Burgeoning is pretty much a one-and-done after the first few turns. Adding in Squandered Resources to exploit the mana base further, such as being able to sacrifice in response to casting Splendid Reclamation or after a Scapeshift to make those Torment of Hailfire or Exsanguinate kills larger and more reliable. More than happy to receive further suggestions, but for the sake of wanting to keep in the spirit of the usual circle of local players am refraining from the usual mass land destruction inclusions such as Jokulhaups or Decree of Annihilation .